Sprouted in Miami’s tropical concrete jungle Julia and Buffalo’s love of nature and music cultivated love songs dedicated to their favorite medicinal herbs. Materia Musica shares these simple songs that remind and inspire youth and people of all ages to connect with plant allies. 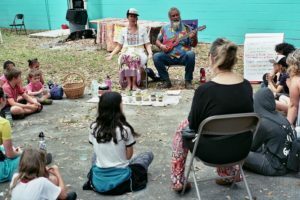 Julia and Buffalo travel with Materia Musica throughout the Americas and grow a garden with the all the herbs they sing about in West Palm Beach, Florida. Enjoy a few of their herbalicious sounds on Soundcloud.